As do all business majors, business administration majors enroll in courses the business core totaling 45 credit hours. In addition, students choose three applied business emphasis areas and from each, choose three approved classes at the 300-400 level. The major totals 71 credit hours. Students add general education and free electives to complete the 120 hours required for the B.S. degree. It is often recommended that the Business Administration major extend one of the emphasis areas into a minor. Minors in the College of Business are available in accounting, finance, information processing, insurance, management information systems, marketing, and operations & supply chain management. Note: The Business Administration minor is open only to non-business majors. The business administration major can be completed on campus (day or night programs), or by distance education (web based learning). While we encourage students to spend all four years at ISU, articulation programs from two-year approved institutions enable you to transfer up to 62 credit hours as a block. The distance education program is based on a 2+2 model - you take classes close to home for the first two years, then take ISU web courses for the last two years. Information about distance education at ISU is found at http://indstate.edu/online/​. 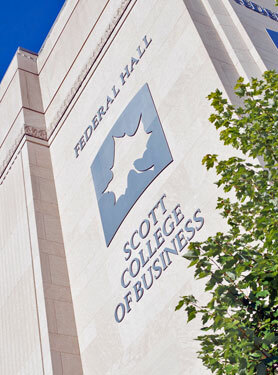 For more information about the Business Administration major, contact the College of Business. Full information can be found in the Business Administration Major Undergraduate Catalog and more on the Academics pages. Students will have knowledge of management or marketing concepts and strategies for managing an organization. Students will have knowledge of finance, accounting or insurance and risk management concepts necessary to effectively manage financial resources of an organization. Students will have knowledge or operations or systems concepts necessary to effectively operate an organization. Full information can be found in the Business Administration Minor Undergraduate Catalog.